John-John Inman Solid Sterling 1975 Christmas Holly Bell Ornament. Early John-John sterling silver three dimensional undated ornament called Holly Bell. 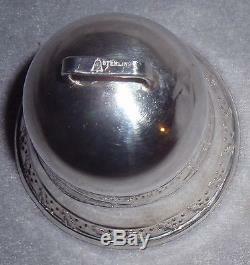 This is hallmarked on the top handle with the JJ in Bell, Sterling hallmark. 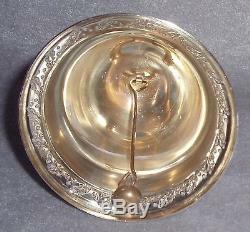 This measures 2 1/2 inches tall and 2 1/2 inches wide at bell bottom, and weighs 38 grams. Ornament is in excellent vintage condition, complete with clapper in the gold washed interior. There is no damage on this and very little evidence of polishing and or use abrasions. There is no original box or other materials included with this. As with all vintage silver, proper polishing upon receipt may be required depending on your preferences. (Jake) Glisson and John Reynolds of John-John Enterprises a division of J. Inman Silversmiths joined forces in 1974 producing hand-cut, three-dimensional, sterling Christmas ornaments. They also made annual ornaments for Halls of Kansas City, Dayton Jewelers, Horchow and others. I believe they still make the Neiman Marcus "Saturn" ball ornaments among others. If by some small chance your item is not satisfactory, your return should still be received within 7 days or less. 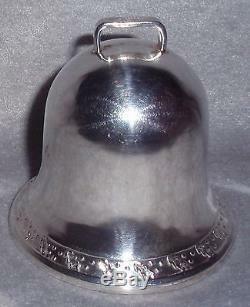 Prior to 1972, the Halls annual bell was produced by the Webster Silver Company. They also made annual ornaments for Dayton Jewelers, Horchow and others. The item "1975 John John Inman Sterling Silver Holly Bell Christmas Ornament Decoration" is in sale since Friday, November 30, 2012. This item is in the category "Collectibles\Holiday & Seasonal\Christmas\ Modern (1946-90)\Ornaments\Metal". The seller is "dkoldtiques" and is located in Barry, Illinois. This item can be shipped worldwide.